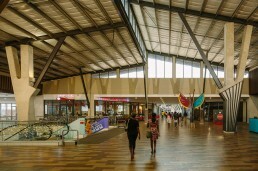 Located in Osokwa, near the recently upgraded Eastern Bypass, Kumasi airport and city centre, Kumasi City Mall was designed to a create a public space that caters to the many varied shopping, lifestyle and social needs of the local communities. A multi-tenant retail development, Kumasi Mall is home to 61 shops and restaurants - with much needed basement parking - as well as street level parking, which in the future could be enclosed to accommodate a further 10 000sqm of trading space. The basement, parking level, ground floor and open-air upper deck are connected by escalators. 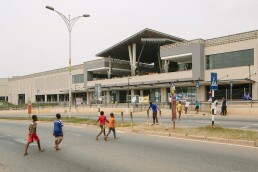 To alleviate traffic congestion in the surrounding areas, the mall has three entrances providing easy vehicle and pedestrian access all round. 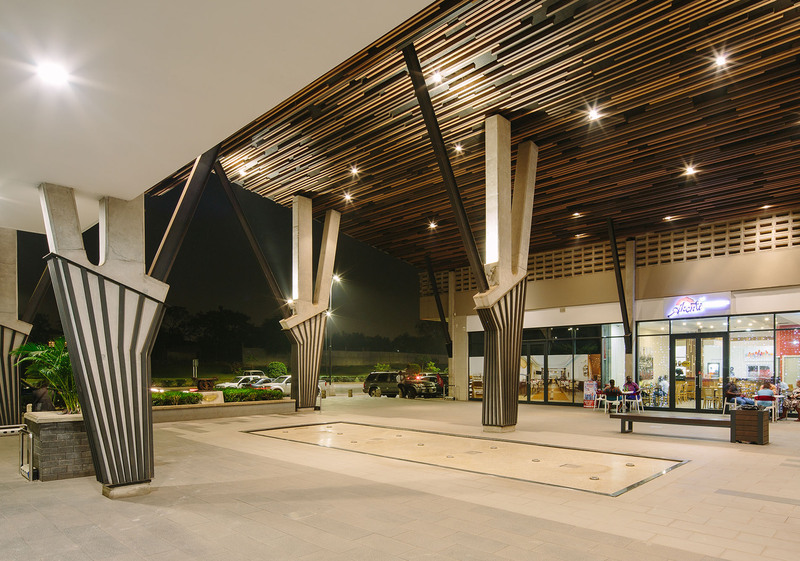 Architecturally, the mall plays tribute to its sense of place both inside and outside, drawing inspiration from the local surroundings, imprinting it with an authentic identity. 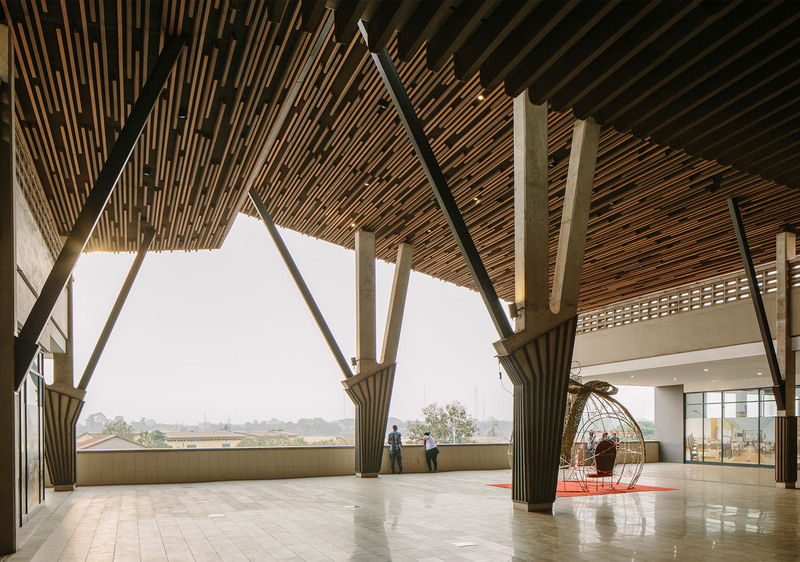 Wood detailing, cast concrete, as well as block work and plaster patterning serve both a design aesthetic and practical purpose of being durable. Form and function flow fluidly through the building, with concrete and wood contrasting to create a contemporary, modern and airy loft like space that is intrinsically local. A graphic representation of a tree is used as a motive inside, on the façade and in the landscaping as well as through out the building as concrete columns and structural roof supports, creating a contemporary and contextual architectural language throughout. Catering to high temperatures ranging between 24 and 34 degrees all year round while embracing the local lifestyle and environment, the natural slope of the site was used to create a semi-enclosed central shaded public area, allowing for passive cooling, while providing a scenic place to socialise and gather and enjoy the elevated view over the city. The dramatic slated wooden ceilings represent a canopy of trees, while the use of local materials and architectural features like Ghanaian breezeblocks root the building within the context of Kumasi. A landmark retail development, Kumasi City Mall presents a new aspirational perspective of Ghana, a view that embraces its origins, celebrates its progress, serves the many needs of the city’s diverse communities and has made a major contribution to the city.